yearbook, arrived today. Bibba has done an incomparably fine job. She may well be very proud of it. It is the best that I have yet seen, I'm sure. Got my pen back from the factory yesterday. Really received considerably quicker than I had anticipated. I had a slightly finer point put in it this time. It will be a little harder for me to use but will make a better scratch. Once again, how about my golf clubs? I wrote some time ago asking if you would send them down along with my shoes. If you haven't given it up as a bad job, ok, but since none of you have mentioned it, I am wondering just what the story is. 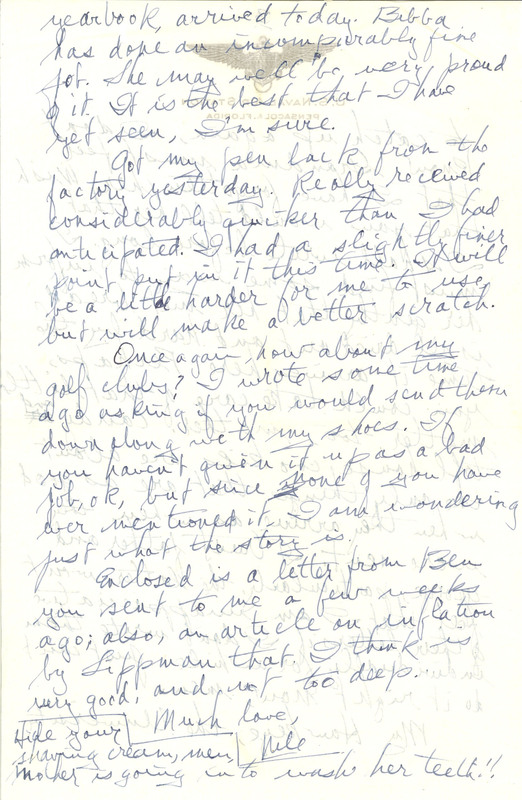 Enclosed is a letter from Ben you sent to me a few weeks ago; also, an article on inflation by Lippman that I think is very good, and not too deep. Much love, Nile Hide your shaving cream, men, mother is going in to wash her teeth! !